Are your shoulders are stiff and tense like mine? If you are like me I know you have tried a lot of things from massage, ibuprofen, heat and ice, and even exercises and movements to help relieve the shoulder pain. In this video I am going to show something different, how to get deep into the joint of the shoulder and prevent and reverse ligamentous contracture with yin yoga. Your shoulder is actually a ball and socket joint that has the potential for a large range of motion. The funny thing is that we actually do not move this joint alot. Most of the time our arms are in front of us typing on a keyboard or mobile device, making meals, lifting children, hugging our loved ones. Our arms don’t really move around a lot giving the shoulder a lot of range of motion. In Yin Yoga we stress our joints to prevent and reverse contracture or the loss of mobility through a joint. Yin Yoga can be helpful to slowly regain natural range of motion and relieve tense and stiff shoulder pain. 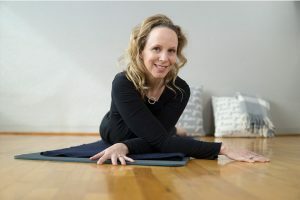 The beautiful thing about yin yoga is that when we stay for awhile in the pose, for five minutes instead of the usual five breaths in a yoga class we are able to target the deeper connective tissues that wrap around the joints. This connective tissue is more dense and less pliant than the superficial that we usually affect when we exercise or practice hatha yoga or vinyasa yoga. Stressing the connective tissues that wraps around the bones of the joints takes longer because it is more plastic in nature. And so we apply slow and gentle traction. With our shoulder joints it is normal and common to experience contracture, that is the loss of mobility through the joint. The ligaments begin to shorten and immobilize creating a kind of shrink wrap around the joint. By applying appropriate pressure and compression to the shoulder joint we increase the pliancy in our shoulder joints coaxing chi and blood flow through the shoulder joint. This helps to revitalize and create resilience in your shoulder joint. Relieving your shoulder pain is not something you can do in just one video. I am going to share with you a good, better and best way to do that now. Best: The best way to relieve your low back pain is with our value added classes in our membership community. We have over 35 of them. I think the best is self-massage with our soft foam roller.